This mesh, which is covered in a coating invented at The Ohio State University, captures oil (red) while water (blue) passes through. Credit: Jo McCulty, courtesy of The Ohio State University. Water passes through the mesh but oil doesn't, thanks to a nearly invisible oil-repelling coating on its surface. In tests, researchers mixed water with oil and poured the mixture onto the mesh. The water filtered through the mesh to land in a beaker below. The oil collected on top of the mesh, and rolled off easily into a separate beaker when the mesh was tilted. The mesh coating is among a suite of nature-inspired nanotechnologies under development at Ohio State and described in two papers in the journal Scientific Reports. Potential applications range from cleaning oil spills to tracking oil deposits underground. 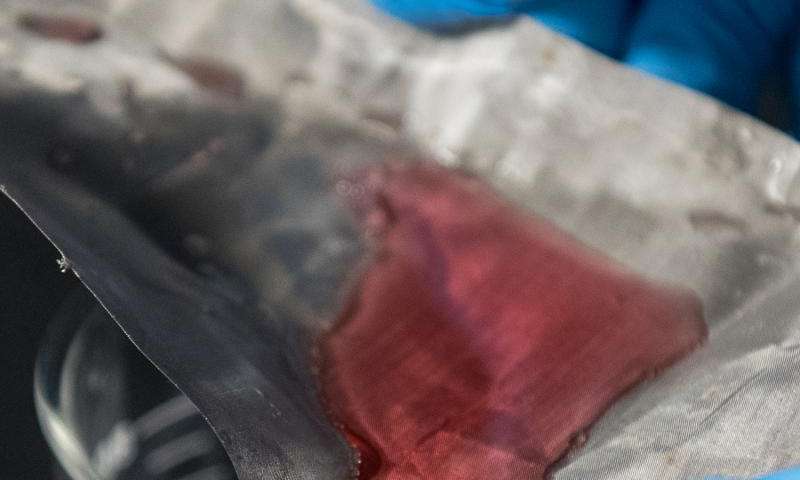 "If you scale this up, you could potentially catch an oil spill with a net," said Bharat Bhushan, Ohio Eminent Scholar and Howard D. Winbigler Professor of mechanical engineering at Ohio State. The work was partly inspired by lotus leaves, whose bumpy surfaces naturally repel water but not oil. 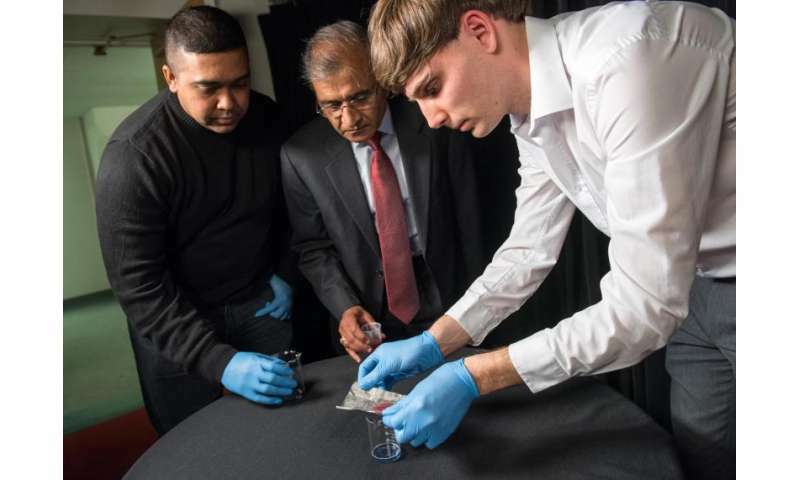 To create a coating that did the opposite, Bhushan and postdoctoral researcher Philip Brown chose to cover a bumpy surface with a polymer embedded with molecules of surfactant—the stuff that gives cleaning power to soap and detergent. Bharat Bhushan (Ohio Eminent Scholar in Mechanical Systems, center), research assistant Dave Maharaj (left) and postdoctoral researcher Philip Brown (right) -- all of The Ohio State University -- demonstrate new technology they have developed for separating oil from water. Credit: Jo McCulty, courtesy of The Ohio State University. The silica, surfactant, polymer, and stainless steel are all non-toxic and relatively inexpensive, said Brown. He estimated that a larger mesh net could be created for less than a dollar per square foot. Because the coating is only a few hundred nanometers (billionths of a meter) thick, it is mostly undetectable. To the touch, the coated mesh doesn't feel any bumpier than uncoated mesh. The coated mesh is a little less shiny, though, because the coating is only 70 percent transparent. The researchers chose silica in part because it is an ingredient in glass, and they wanted to explore this technology's potential for creating smudge-free glass coatings. At 70 percent transparency, the coating could work for certain automotive glass applications, such as mirrors, but not most windows or smartphone surfaces. "Our goal is to reach a transparency in the 90-percent range," Bhushan said. "In all our coatings, different combinations of ingredients in the layers yield different properties. The trick is to select the right layers." He explained that certain combinations of layers yield nanoparticles that bind to oil instead of repelling it. Such particles could be used to detect oil underground or aid removal in the case of oil spills. The shape of the nanostructures plays a role, as well. In another project, research assistant Dave Maharaj is investigating what happens when a surface is made of nanotubes. Rather than silica, he experiments with molybdenum disulfide nanotubes, which mix well with oil. The nanotubes are approximately a thousand times smaller than a human hair. "There are natural defects in the structure of the nanotubes," he said. "And under high loads, the defects cause the layers of the tubes to peel apart and create a slippery surface, which greatly reduces friction." Bhushan envisions that the molybdenum compound's compatibility with oil, coupled with its ability to reduce friction, would make it a good additive for liquid lubricants. In addition, for micro- and nanoscale devices, commercial oils may be too sticky to allow for their efficient operation. Here, he suspects that the molybdenum nanotubes alone could be used to reduce friction. "We've studied so many natural surfaces, from leaves to butterfly wings and shark skin, to understand how nature solves certain problems," Bhushan said. "Now we want to go beyond what nature does, in order to solve new problems." "Nature reaches a limit of what it can do," agreed Brown. "To repel synthetic materials like oils, we need to bring in another level of chemistry that nature doesn't have access to." Been saying so for a long time. Nobody listens. This is a perhaps more elaborate than necessary convergence of nanostructure engineering and surface chemistry. Coating the mesh with a hydrophobic polymer (e.g. a polyolefin) would produce a material that would repel water but collect oils. Embedding the surfactant in the polymer at a suitable concentration would simply reverse this to make the material hydrophilic rather than hydrophobic. This is the case with Gram-negative bacteria, which have lipopolysaccharide surfactants embedded in the external lipid layer of their cell membranes. The silica appears to impart nanostructure to inhibit the formation of larger droplets. The molybdenum disulfide, which has many interesting properties of its own (non-toxic, refractory, and a better dry lubricant than powdered graphite), would apper to be superfluous.